This unofficial fan site is primarily dedicated to the creation and celebration of the Visitor Experience at the Abraham Lincoln Presidential Museum. For further information on both the Museum and Library, please visit the official Abraham Lincoln Presidential Library and Museum web site at www.alplm.org. The Abraham Lincoln Presidential Museum is considered to be the first major Experience Museum. Designed, created and produced by BRC Imagination Arts, the museum combines priceless historical artifacts with BRC's innovative, contemporary storytelling technologies. Visitors are offered an engaging, emotional and educational experience through immersive, "you-are-there" exhibits. Visitors and scholars have access to a great and extensive collection of materials relating to Abraham Lincoln and his era through a variety of venues. Included as well is an Education Department. 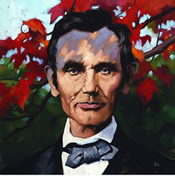 BRC Imagination Arts' process in the creation of the Abraham Lincoln Presidential Museum. Explore highlights of the presidential library and museum and all they have to offer. Embark on tours of historic Lincoln sites and other points of interest in the Springfield area.